This is a cool set of books! Yo! (I've got original Ready Ref's Sheets, but it's too delicate to do much with at this point). Thanks for the glimpse into my RPG past! Neat! I'll even save you shipping! Just organize PubCon! Some canonical texts to put to good use. The cat isn't included? I'm in even if not! My son would love the coloring book. I'm in! Jack Chick dies and we get gaming stuff! What the heck! I live in Canada and we never get anything good. Thanks, Erik. Does it come with free cat hair? Sweet! Pick me! Pick Me! Very long time lurker here. I started running some games with a nine year old boy this year using either labyrinth lord with b/x and swords and wizardry core and the white box edition from Mr. Mason up top. Needless to say, he has been enjoying it. I plan on starting a campaign in Greyhawk using a mix of B/X with S&W and having an extra copy of basic on hand would be handy. Ready Ref? Sign me up. Great stuff being offered here. Thanks Erik! Another day, another chance to win something cool. Sounds cool to me too. Please, gods, let me win! I shall throweth mine hat into the ring once more! OK, I don't know if it's cool or not to jump in after winning the last one, but if it is, I'd like to have a shot. I've been trying to find a print copy of those ready ref sheets at a reasonable price for a while. Pure Goodness, Count one for me. I love the Ready Ref sheets, I've only ever seen really bad copies of them. Yes, it will be my precious. count me in! I haven't colored in a coloring book in over 40 years! Ready ref and a coloring book? Sounds good to me. Can I just say this is the first time I've commented on this? Sure, why not? Let's do this. Consider me please! I'm in! Have always wanted a copy of Ready Ref Sheets ! 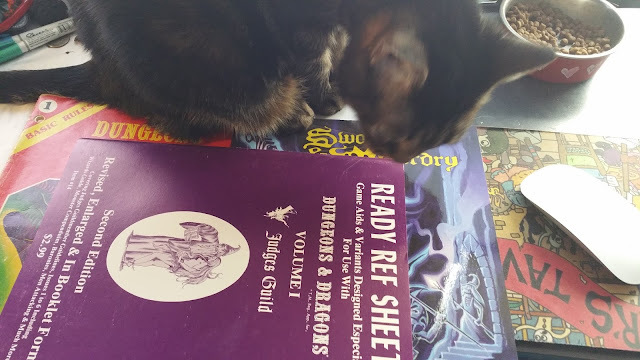 I've never had a print copy of any OSR rules. Count me in. I hope I win, but good luck to everyone! Good luck to everyone. But mostly to me. LOOT! Who do we have to kill? Cool, pledged for the Kick starter.